Ubud is located in central Bali and is far removed from the bikini party scene of Kuta. 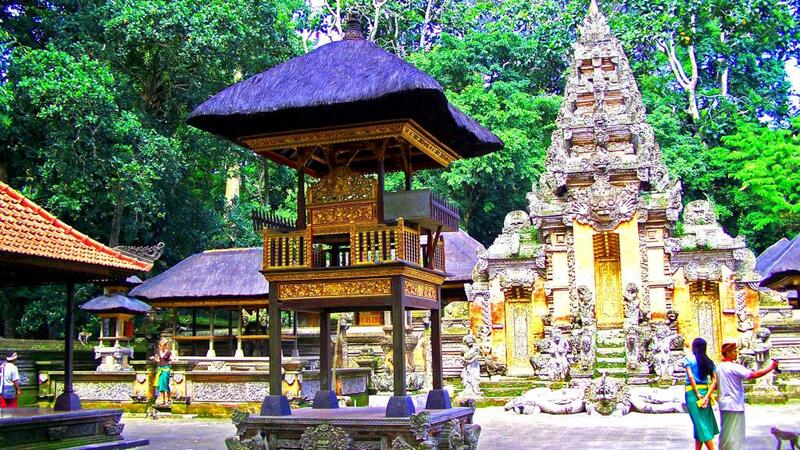 Regarded as the cultural centre of Bali, Ubud is famous as an arts and crafts hub. Much of the surrounding town and village consists of artist workshops and galleries where remarkable architectural sights and artistic gems can be found. Ubud is so full of things to see and do it would be wise to allocate at least a week for your visit. Many of the key historical sights which are such major attractions lay out of town, some as far as 20 km away. It would be worth your while to join a tour when exploring these sights. You may like to find your own way to attractions such as Goa Gajah, Gunung Kawi, Pura Kehen and Tirta Empul however you are better off to find a knowledgeable guide once you arrive. Whilst these sights are safe to explore on your own and are a visual feast, their cultural and spiritual significance may not be conveyed without a guide. Ubud is characterised by gently sloping rice paddies and their vivid green can be astoundingly beautiful, particularly to the south and south east of the town. Approaching these natural wonders, it is worth a stop to really take in the brilliance and beauty of these sights. North east of the central Ubud the land ripples with assorted elevations and these make excellent vantage points from which to view the archetypal rice terraces. The village of Tegallalong is also famed as a regular tourist stop to view the rice paddies. Ubud has an assortment of art and jewellery shops and whether you're just window shopping or you plan on buying up big, there's plenty to look at. If you're looking for high quality goods, the boutique stores on Jl Monkey Forest and Jl Raya Ubud are the places to be. The local market is a better option if you're after small, cheap trinkets to take home as gifts or keepsakes. Ubud is at an elevation of 600 m above sea level and it is due to this that Ubud is able to enjoy cooler temperatures than those experienced on the coast. It can even be necessary to wear a cardigan in the evening depending on how low temperatures drop, however during the day temperatures and humidity generally remain high. Getting around Ubud is fairly simple. Walking is an efficient and cost-effective method however the metered taxis and motorbikes available for rent that are everywhere in Ubud are more convenient if you're in a hurry. If you're feeling adventurous you could try riding on the back of a local scooter or ojek and whilst being a fast and cheap option, they are not for everyone and are not a particularly family friendly option.